Featured Car: Cost Cutting Skyline Production? I found out this accidentally when I did my wheels swap for No.20 Skyline R34 and R32 30th Anniversary, both models have same base which interchangeable. I thought this is only for these 2 models, but when check my UJ R33 and R34, they possess same base too. 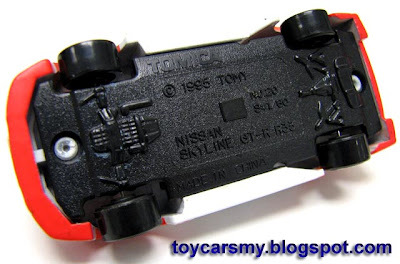 I wondering was Tomica on cost cutting when they design Skyline, or it is special arrangement with Nissan. 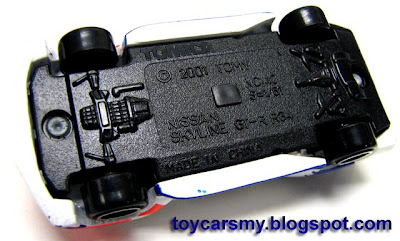 The first Skyline GT-R casting on this shared base is R32 in 1989 scale 1/59. 6 Years later, year 1005 R33 in scale 1/60 and the last one 2001 R34 scale 1/61. The base are identical except the engrave wording at the center part. 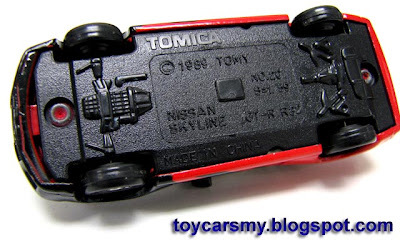 You can tell the square line is where Tomica change their description.